Can a recovering nail biter become one of the world's top manicurists? In celebrity manicurist Carla Kay's case, the answer is a resounding yes. Some of the biggest names in Hollywood have had their tips polished by Carla, including Gwen Stefani and Annette Bening. Read on to find out who inspired her to get into the nail business, the nail product she can't live without and so much more. I grew up in Shady Hills, Florida. I was always a nail biter throughout my school days. I went to get acrylics done at my local salon -- a woman by the name of Debbie did my nails. I was so intrigued by her. I loved rock and roll music and she had her own band and owned the nail salon. I knew at that moment I wanted to do nails. I thought how great it would be to work and have fun at the same time! After I graduated, I enrolled in cosmetology school. This woman also told me that if I went to school, she would give me a job after I received my license. So I completed my hours and the rest is history. I landed a job with her, she taught me many things and I had lots of fun. I found my fun by doing what I loved. You have quite an impressive celebrity clientele! Are there any looks you've done that stand out as your favorites? One of my favorite looks that stands out for me the most is a shoot I did with Pamela Anderson and the photographer David LaChapelle. David wanted me to create lizard nails for her, so I sat on set gluing nail tips together then applying acrylic over the top of the tips to form a ribbed effect so they would look like lizard nails. That was a creative job for me. Are there any nail trends for fall and winter that you're really excited about? Beige nails with bold moons. For example, beige with black moons are super chic in my opinion. I am loving the earth tones too. 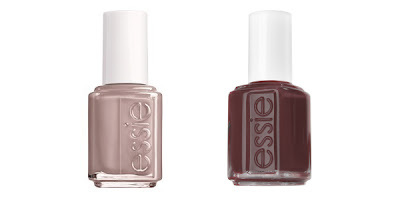 Essie has a great mud-like color called Glamour Purse, I am also a fan of Essie Bordeaux. What are your product essentials? My essentials always include cuticle oil. 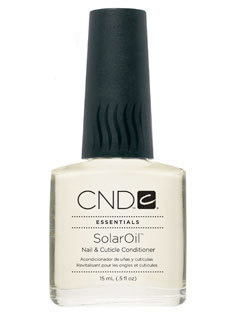 CND Solar Oil is one of my favorites. I also try to have a file on hand just in case the nail snags. 1) You should always try to keep your nails polished. This keeps elasticity in your nails. When the nails are bare they tend to break more. If you want to have natural nails, always apply a base coat. This will help them from breaking. 2) Apply cuticle oil at least once a day to help with hydration, and apply a top coat every other day to help seal the polish and to bring back the shine. This will help prolong your manicure. 3) It's best to carry a soft finger nail file in case you get a snag in your nail so you can smooth it out and the nail doesn't break. In my spare time, I am taking care of our 3-year-old and I am traveling as much as possible. Our son has been on 32 flights so far! We have traveled to St. Thomas several times and to Honduras. My husband is an architect, so we enjoy going to museums with our little one. We just toured the Frank Lloyd Wright Museum and my son had a great time. So as far as spare time, I enjoy being with my husband and son. 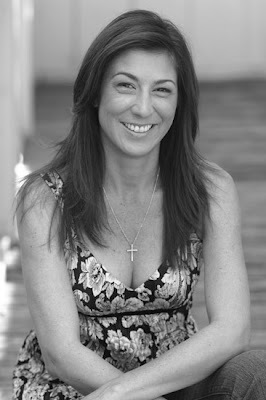 I had a standing appointment with Carla everyother Thurs. at 4:00 for several years before I moved to Santa Fe, and I went through 5 manacurists before I found a good one! She's a real treat to be around and my nails were always perfect! I wish I could afford going to her for my monthly manicure :( May I ask what kind of nail file does she normally use on her clients? My manicurist told me I should only use glass nail files cause they're safer.